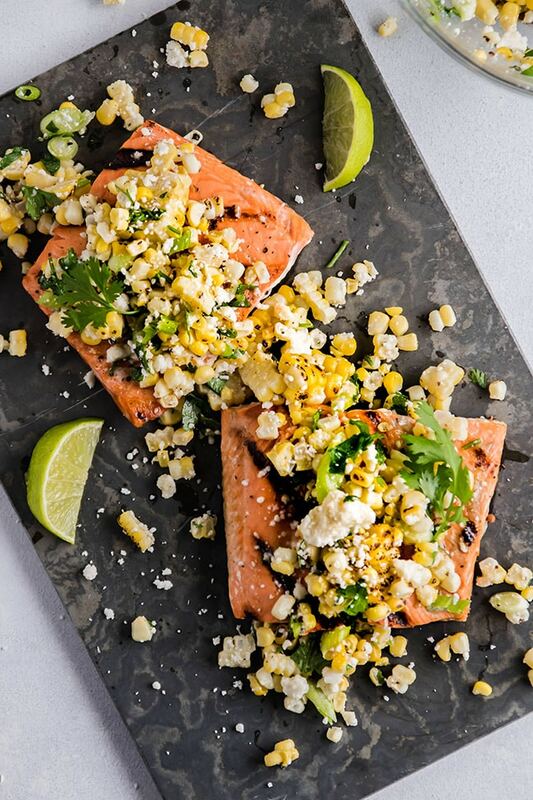 This easy grilled salmon with corn, cotija, cilantro, and green onions is ready in less than half an hour. Internet, meet the easiest summer meal ever. Easiest summer meal ever, meet the internet. Wild Sockeye Salmon! Grill it up. All it needs is a little salt and pepper. Cotija Corn Salsa! 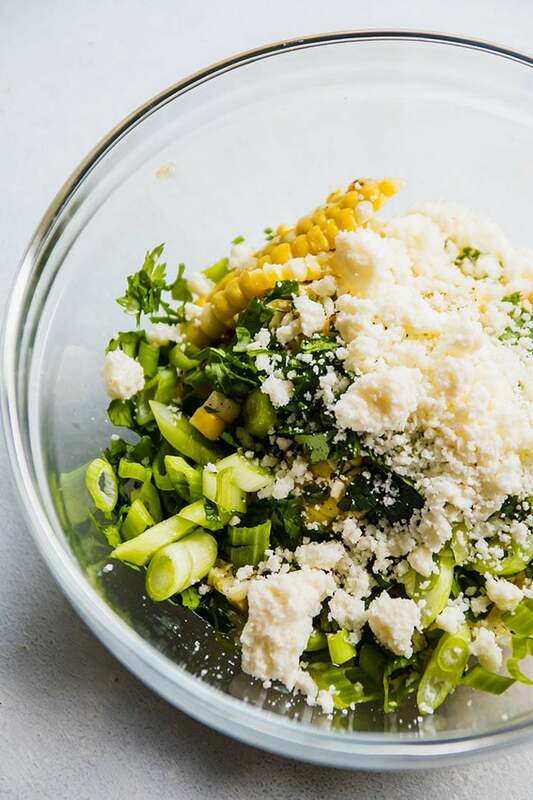 We’re keeping it simple with just grilled corn, cilantro, lime juice, and green onion (although adding some jalapeno is both allowed and encouraged). I also used Cacique® Cotija here, and it crumbles so beautifully into the salsa – you get just the right amount of saltiness to balance out the sweet corn. 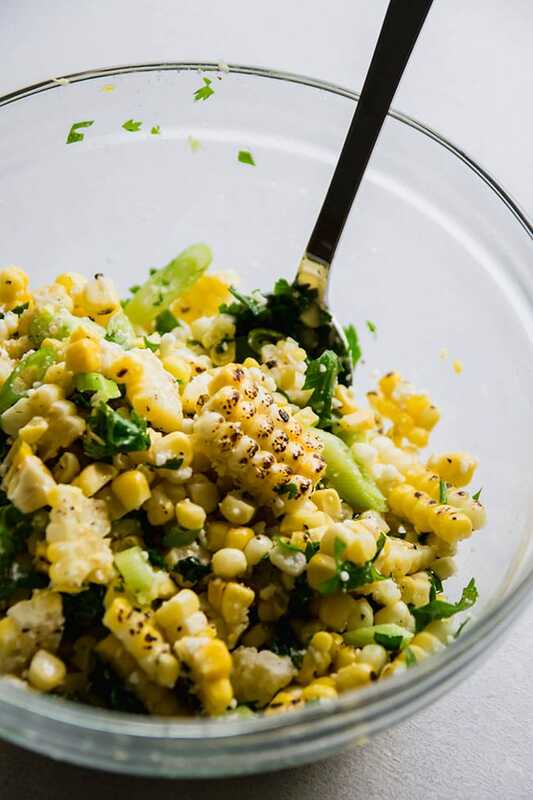 This corn salsa is also super easy to customize: add some jalapenos, avocado, tomatoes, or whatever you have on hand! 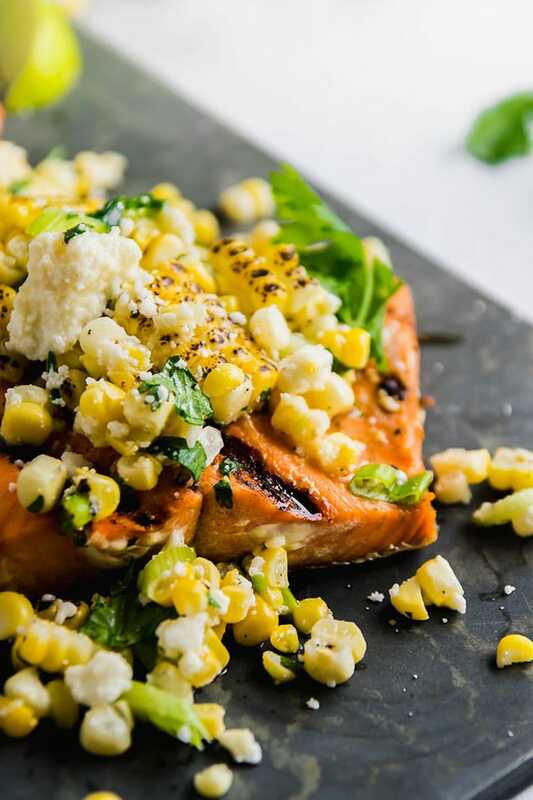 Sweet corn and salmon taste OH-so-good together, and the hint of saltiness from the Cotija adds some balance that really takes this meal from good to great. Also, did I mention how quick and easy it is? Because this is seriously SO quick and SO easy. 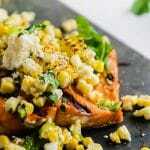 Easy grilled salmon recipe with grilled corn salsa. 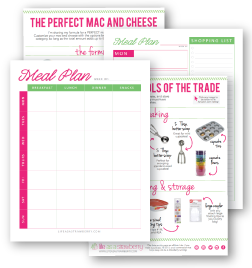 Preheat a grill or grill pan until it’s very hot. Pat the salmon with a paper towel until it is very dry, then season with salt and pepper. Use a pastry brush (or a paper towel that you hold with kitchen tongs) to brush the grill grates with canola oil. Place the salmon skin-side up on the hot grill and let cook for 3-4 minutes per side. When it’s ready to flip, the fish should lift easily off the grill with a spatula. Top with corn salsa, sprinkle with some extra cilantro and cotija, and serve. Combine all ingredients in a medium bowl and stir to combine. Serve immediately or keep in the fridge for up to a week. This was a big hit with my husband, who LOVES salmon. I just served this to him after a rough day at work. He devoured it, and spoke only to say this was “really good” twice, and ask the name of the recipe. And it definitely was quick and easy. I had a bit of trouble finding cotija cheese that wasn’t grated, but it was worth the search. Thanks so much for this recipe! Hello Stephanie, we LOVE hearing these stories! Thank you for sharing.